Silver nanoparticles (AgNPs) show different physical and chemical properties compared to their macroscale analogs. This is primarily due to their small size and, consequently, the exceptional surface area of these materials. Presently, advances in the synthesis, stabilization, and production of AgNPs have fostered a new generation of commercial products and intensified scientific investigation within the nanotechnology field. The use of AgNPs in commercial products is increasing and impacts on the human health are largely unknown. This article discusses AgNPs synthesis approaches, characterization, human safety and presents an overview of its general and antibacterial applications. Finally, we review the challenges associated with AgNPs synthesis, characterization and future prospects of AgNPs for the treatment and prevention of currently emerging infections. Keywords: Silver nanoparticles, human safety, antibacterial applications, antibacterial applications, AgNPs synthesis. Keywords:Silver nanoparticles, human safety, antibacterial applications, antibacterial applications, AgNPs synthesis. Abstract:Silver nanoparticles (AgNPs) show different physical and chemical properties compared to their macroscale analogs. This is primarily due to their small size and, consequently, the exceptional surface area of these materials. Presently, advances in the synthesis, stabilization, and production of AgNPs have fostered a new generation of commercial products and intensified scientific investigation within the nanotechnology field. The use of AgNPs in commercial products is increasing and impacts on the human health are largely unknown. 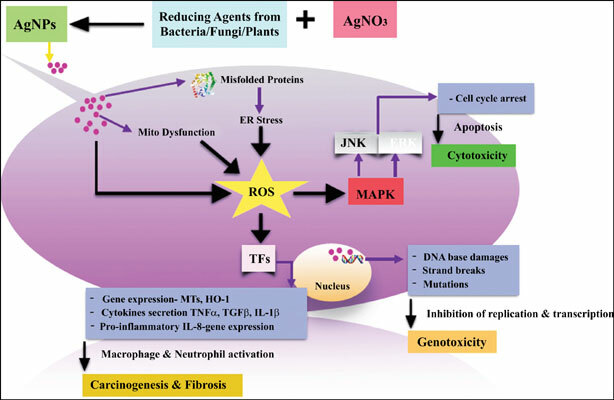 This article discusses AgNPs synthesis approaches, characterization, human safety and presents an overview of its general and antibacterial applications. Finally, we review the challenges associated with AgNPs synthesis, characterization and future prospects of AgNPs for the treatment and prevention of currently emerging infections.